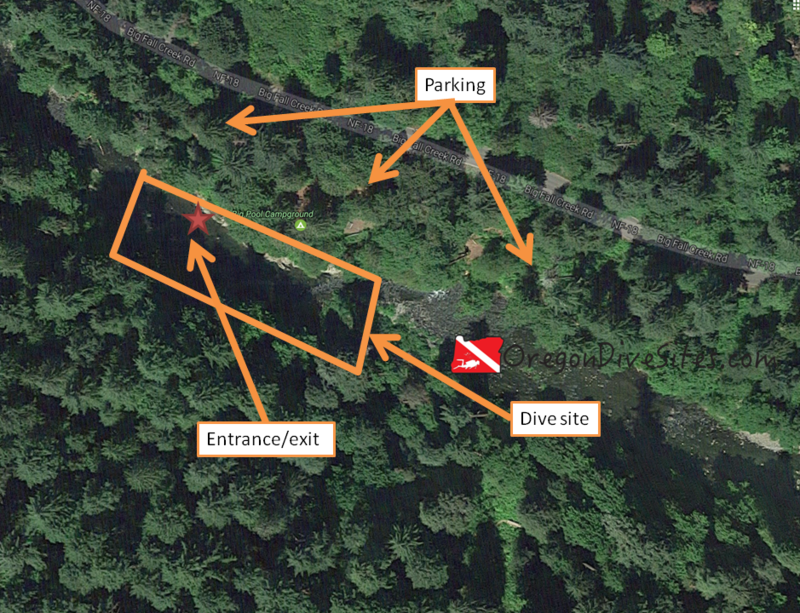 Big Pool on Fall Creek outside Eugene, Oregon is a fun dive site perfect for a lazy summer or early fall afternoon SCUBA session. We have heard this site also called Ye Olde Rope Swing Hole although that name seems to have fallen out of favor in the last few years. Many divers in Oregon would never think to go dive a swimming hole on a creek in the Central Cascades. We have done it and we can say it’s pretty fun. 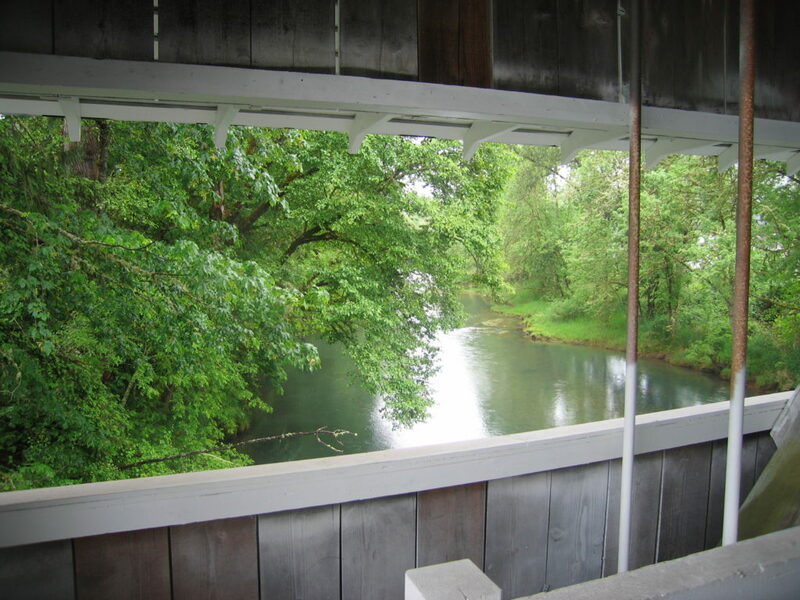 Fall Creek from the Unity Covered Bridge a ways below Big Pool Swimming Hole. This site is fun to dive. There isn’t any big highlight other than it’s just plain fun to scramble down the bank and go diving somewhere people usually swim. We have found glass pipes, a variety of beverage containers, and sunglasses in the bottom of Big Pool. This is also a good place to go after crayfish. We caught a pile here once with nothing more than our mesh bag (we have a mesh bag we highly recommend our Gear We Use page) and our hands. With being so shallow, you can spend a long time diving this site. Going slow along the bottom looking for things lost by swimmers can be a lot of fun. The little town of Lowell, Oregon is just down the road. Eugene and Springfield are a little further away and much larger. Head up the Willamette Highway and then follow signs for Lowell. Take Moss Street north out of Lowell (it becomes Jasper-Lowell Road) and then turn right onto Big Fall Creek Road. Go through the little community of Unity and head upstream above the dam and Fall Creek Lake. Look for signs for Big Pool Campground. Usually you can squeeze into the Big Pool Campground parking area or nearby by pulling off the forest road. Don’t block other people in. Imagery ©2017 Google, Map data ©2017 Google. Big Pool is a fun place to do a dive not far from Eugene. You might encounter a bit of current depending on the time of year and how much water is flowing down the creek. Upriver is against the current and downriver is with the current. The site isn’t very large so you don’t have to worry about getting lost. You have to walk down a bit of a scramble of a bank from the campground area to get to Big Pool. We had to walk through someone’s campsite the last time we were here. the Forest Service may have improved the campground since last we went diving at Big Pool. Usually there is a tiny bit of current but nothing bad. Conditions here are benign unless you’re diving during the big spring snow melt. When the thaw is on and the creek is raging, Big Pool might be a bit too much for most people to dive. People like swimming in Big Pool. Be mindful of other users of the SCUBA dive site. People also like to jump into the water from a few different overhanging areas. It might not be a bad idea to have a friend stay on the surface to keep people from jumping on top of your bubbles while you are trying to surface. As long as you stay off the bottom, you can get 15 feet of visibility here. If you stir up the silt on the bottom, it’s easy to go down to 3 feet of viz. At the end of summer, water temperatures can be up around 65F. During the spring snow melt, it can be around 34F. The summer and fall are the best times to dive this site but it can be accessed most of the year as long as the road is open and not covered in snow. We found 25 feet here once but most of the site is shallower than that. Open water divers can dive this site without too much problem. This site is just below 1000 feet so by the training standards we are familiar with, this does not count as an altitude dive. If you go further up Fall Creek, you will get into altitude diver territory. This is an easy dive. The hardest part is the scramble down and up the bank. About 100 feet unless you get really unlucky with parking. No surface swim at Big Pool! Please be considerate of other users of this site. People come here to relax, swim, chill out, and have a good time. Talking with other site users before you go diving can go a long way to improving relations between SCUBA divers and the public. There is a local dive shop in Eugene with full service gear repair, sales, and air fills. We haven’t tried any of the restaurants in this area so please let us know if there is one we should check out! There are many campgrounds in this area including right at the dive site. There are also primitive camping opportunities. We haven’t tried any of the area hotels so please let us know if you find a hotel that is SCUBA diver friendly.